How do GRASS/FISP sequences work? GRASS/FISP sequences are among the oldest and simplest of the steady-state coherent gradient echo sequences. Although they are not as frequently used in their pure forms any more (having been largely replaced by TrueFISP and other "balanced" sequences), understanding how they create an MR signal and those signal properties are still very instructive. GRASS/FISP may be performed in either 2D or 3D mode, usually with a short TR. 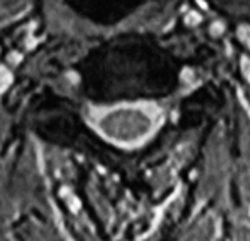 Most often this technique is used to generate T2*-weighted images, although other weightings are possible. From previous Q&A's we described how a chain of closely and evenly spaced RF-pulses could generate two different types of MR signal — one FID-like immediately after each RF-pulse and the second Echo-like immediately before each RF-pulse. 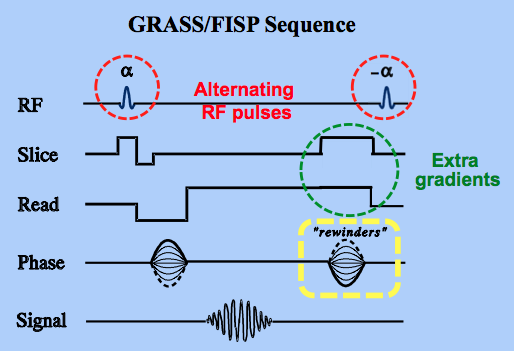 GRASS/FISP sequences collect the FID-like signal while suppressing the Echo-like signal. Advanced Discussion tab if you wish to know in detail how each of these modifications works. Click on the button to go to a hidden advanced page! Chavhan GB, Babyn PS, Jankharia BG et al. Steady-state MR imaging sequences: physics, classification, and clinical applications. Radiographics 2008;28:1147-1160. Elster AD. Gradient echo imaging: techniques and acronyms. Radiology 1993; 186:1-8. (My older review; still accurate, though some vendors have gone out of business. 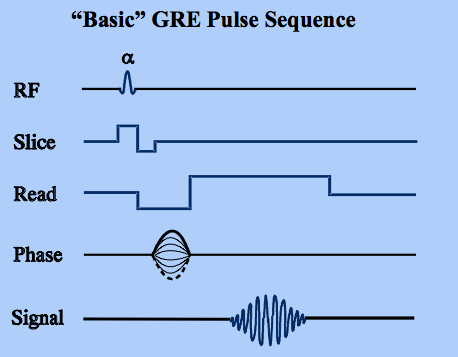 Gives a good history of the development of GRE sequences). Hargreaves B. Rapid gradient-echo imaging. J Mag Reson Imaging 2012;36:1300-1313. (A great, but not overly technical, modern review). What is meant by steady-state free precession (SSFP)?